Art collector Charles Saatchi says images of him grasping his wife, celebrity chef Nigella Lawson, by the neck show "a playful tiff". The photos in the Sunday People were taken about a week ago in London. "The pictures are horrific but give a far more drastic and violent impression of what took place," he reportedly told London's Evening Standard. Ms Lawson has not commented. Scotland Yard said a 70-year-old man had been cautioned for assault. In Monday's Evening Standard, Mr Saatchi said: "About a week ago, we were sitting outside a restaurant having an intense debate about the children, and I held Nigella's neck repeatedly while attempting to emphasise my point. "There was no grip, it was a playful tiff. "Nigella's tears were because we both hate arguing, not because she had been hurt. "We had made up by the time we were home. The paparazzi were congregated outside our house after the story broke yesterday morning, so I told Nigella to take the kids off till the dust settled." 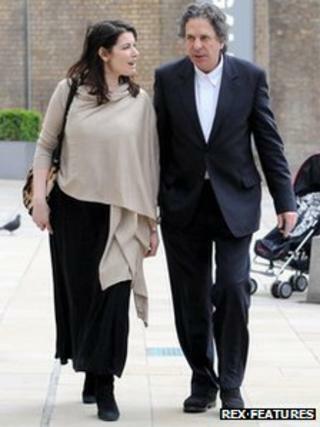 Ms Lawson and Mr Saatchi, a former advertising executive, have been married since 2003. She has two children, Cosima and Bruno, from her marriage to journalist John Diamond, who died in 2001. Ms Lawson's spokesman confirmed that she had left the family home with her children, but did not say whether it was a permanent or temporary move. On Monday evening Scotland Yard said: "Officers from the Community Safety Unit at Westminster were aware of the Sunday People article which was published on Sunday 16 June and carried out an investigation. "This afternoon, Monday 17 June, a 70-year-old man voluntarily attended a central London police station and accepted a caution for assault. "